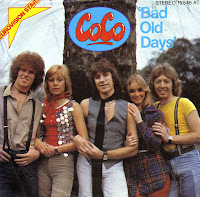 The group CoCo formed in the first half of the Seventies but they only rose to fame in 1978 when they represented the United Kingdom during that year's Eurovision Song Contest. The group consisted of Terry Bradford, Josie Andrews, Cheryl Baker, Keith Hasler and Paul Rogers. 'Bad old days' finally reached 11th place in a field of 20 participants. Subsequently, the single reached number 13 in the UK singles chart. In contrast to previous years, the song had not reached the chart in the weeks leading up to the contest and had been noticeably absent. Its eventual peak of 13 occurred several weeks after their appearance in the Contest. It was to be the group's only hit.